With this concept tire, Lanxess intends to demonstrate the importance of its neodymium-based performance butadiene rubber (Nd-PBR) to increase durability, especially in AA-rated tires. Although durability will not be rated on the new EU tire labels, it will be a key differentiation among top-ranked tires. Traditionally, an improvement in durability has always come at the expense of either rolling resistance or wet grip. 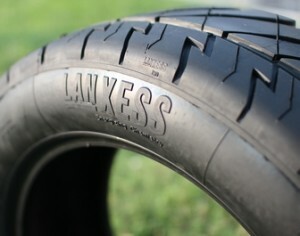 Lanxess says its green tires can reach their peak performance with formulations containing both Nd-PBR and solution styrene butadiene rubber (SSBR), a material that helps to reduce rolling resistance and improve grip on wet roads. Cars equipped with “A” rated tires needs 18-21m less to come to a standstill from a speed of 80 km/h compared to “F” rated tires. The German specialty chemicals company also launched a new fuel saving calculator that helps drivers to save money and bring less harm to the environment. Developed in cooperation with the Technical University of Munich, Germany, it was then tested and certified by TÜV Rheinland.